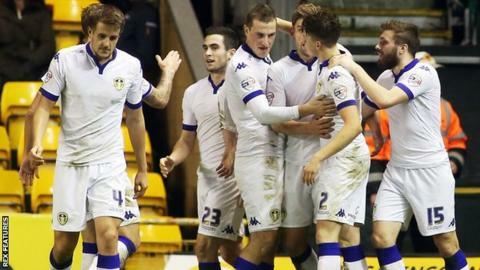 Leeds produced a fine fightback to beat Wolves and leave Wanderers without a Championship home win since 3 October. Benik Afobe slotted the hosts into an early lead at Molineux before Sam Byram equalised just before half-time. Stuart Dallas put Leeds ahead shortly after the break when his powerful shot beat Carl Ikeme at the near post. Byram added his second when Charlie Taylor's left-wing cross hit his shoulder and looped in, before Nathan Byrne steered home a consolation. Wolves' first defeat in six games sees them slip to 17th in the Championship table while Leeds overtake them and rise to 14th. The turnaround by Steve Evans' Leeds either side of the break left the home supporters stunned after they had seen Wolves dominate most of the first half. Dallas gave Wolves an early scare as his dipping volley from 25 yards struck the post. But moments later Afobe, recalled to the starting line-up in place of Adam Le Fondre, latched onto James Henry's knock down and finished calmly past Marco Silvestri. Afobe shot just wide on the turn and Jordan Graham forced a good save from Silvestri, but the hosts were made to pay for not making their superiority count when winger Byram played a neat one-two with Chris Wood and finished well. Leeds looked a different side after half-time as Northern Ireland international Dallas and Byram put them into a comfortable lead and Wood was denied twice by Ikeme. Substitute Byrne gave Wolves some hope with a neat half-volley at the back post from Graham's cross but despite piling men forward in the final 10 minutes, Kenny Jackett's side were unable to find an equaliser. "Leeds out-powered us. We had to withstand the pressure and we didn't. At the start of the second period they had too much power for us. "Physically, I thought that we looked second best. We needed to defend as a side and we found defending tough. "We came back at the end but we were always chasing the game. We need to rectify what is wrong and the move on. We have to come through this spell." "Young Sam [Byram] has been good on the training ground for the last two weeks and I said to him that his chance is coming. "But he is so good in attacking areas. We love the kid to bits and I have said before that if he comes home with my daughter I will be quite proud! "He has played really well and everyone in the dressing room is really pleased for him." Match ends, Wolverhampton Wanderers 2, Leeds United 3. Second Half ends, Wolverhampton Wanderers 2, Leeds United 3. Attempt missed. Mirco Antenucci (Leeds United) right footed shot from outside the box is high and wide to the right. Attempt missed. Alex Mowatt (Leeds United) right footed shot from outside the box misses to the left. Assisted by Sam Byram. Attempt missed. Nathan Byrne (Wolverhampton Wanderers) left footed shot from outside the box is close, but misses the top left corner. Assisted by Jordan Graham. Attempt missed. Danny Batth (Wolverhampton Wanderers) header from the centre of the box is just a bit too high. Assisted by Jordan Graham with a cross. Attempt blocked. Nathan Byrne (Wolverhampton Wanderers) right footed shot from the right side of the box is blocked. Corner, Wolverhampton Wanderers. Conceded by Charlie Taylor. Substitution, Wolverhampton Wanderers. Conor Coady replaces Jack Price. Nathan Byrne (Wolverhampton Wanderers) wins a free kick on the right wing. Offside, Wolverhampton Wanderers. Danny Batth tries a through ball, but Benik Afobe is caught offside. Goal! Wolverhampton Wanderers 2, Leeds United 3. Nathan Byrne (Wolverhampton Wanderers) right footed shot from the centre of the box to the bottom left corner. Assisted by Jordan Graham with a cross. Substitution, Leeds United. Mirco Antenucci replaces Chris Wood. Attempt missed. Adam Le Fondre (Wolverhampton Wanderers) header from the right side of the six yard box is close, but misses to the right. Assisted by Jordan Graham following a set piece situation. Nathan Byrne (Wolverhampton Wanderers) wins a free kick in the attacking half. Offside, Wolverhampton Wanderers. Kevin McDonald tries a through ball, but Benik Afobe is caught offside. Substitution, Wolverhampton Wanderers. Nathan Byrne replaces James Henry. Goal! Wolverhampton Wanderers 1, Leeds United 3. Sam Byram (Leeds United) header from the right side of the six yard box to the bottom left corner. Assisted by Charlie Taylor with a cross. Attempt missed. Sam Byram (Leeds United) right footed shot from outside the box misses to the left. Assisted by Chris Wood with a headed pass. Substitution, Wolverhampton Wanderers. Adam Le Fondre replaces Dave Edwards. Attempt missed. Liam Bridcutt (Leeds United) right footed shot from outside the box is high and wide to the right. Attempt saved. Chris Wood (Leeds United) right footed shot from the centre of the box is saved in the centre of the goal. Giuseppe Bellusci (Leeds United) is shown the yellow card for a bad foul. Foul by Giuseppe Bellusci (Leeds United). Jordan Graham (Wolverhampton Wanderers) wins a free kick on the right wing. Attempt missed. Souleymane Doukara (Leeds United) left footed shot from a difficult angle on the left misses to the right following a corner. Attempt saved. Chris Wood (Leeds United) header from the centre of the box is saved in the centre of the goal. Assisted by Stuart Dallas with a cross. Corner, Leeds United. Conceded by Ethan Ebanks-Landell. Goal! Wolverhampton Wanderers 1, Leeds United 2. Stuart Dallas (Leeds United) right footed shot from the right side of the box to the bottom right corner. Assisted by Souleymane Doukara. Kevin McDonald (Wolverhampton Wanderers) wins a free kick in the attacking half. Corner, Leeds United. Conceded by Carl Ikeme. Attempt saved. Chris Wood (Leeds United) left footed shot from the left side of the box is saved in the centre of the goal. Assisted by Souleymane Doukara. Second Half begins Wolverhampton Wanderers 1, Leeds United 1.